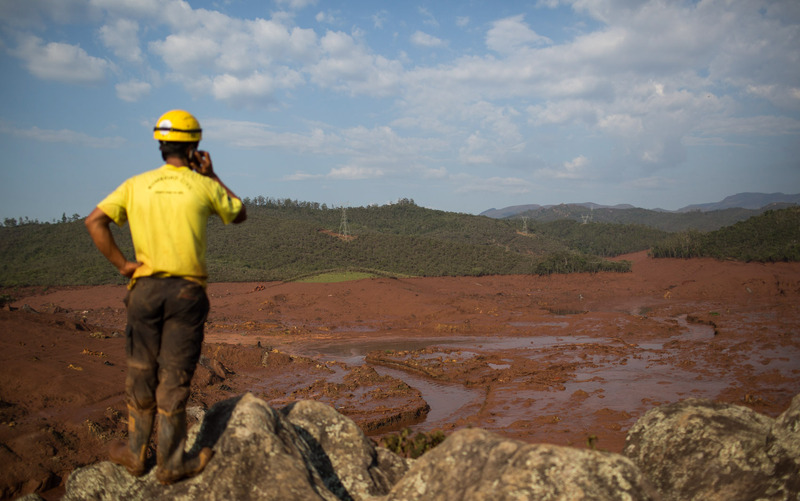 There are reports this morning of a disastrous tailings dam failure affecting the town of Bento Rodrigues in Brazil. Current reports suggest that at least 15 people have been killed and as many as 45 more may be missing. There may be a lack of independent review, presumably to avoid the time delays and costs associated with this. The prices of commodities are currently very low. Iron ore commodities prices peaked in 2011. It would be interesting to see images of the dam itself. Being in Brazil right now, I will try to get as much information as I can and post any new information I can get. It is with a sad irony that one must point out that one of the authors of the paper you mention, Todd Martin, was later heavily involved in the design and operation of the Mount Polley TSF, which failed in 2014. Other telephoto shots in that suite show what appears to be a high water line many tens of feet above the valley floor. I would not be surprised if there were multiple dam failures based on the sheer volume the high water line represents. Other photos show what appears to be a deep surge of material, followed by relatively rapid drawdown. It’s as if this part of the valley filled up w/tailing sludge, then drained thru a smaller outlet. * A worker gives an interview in the article saying that at lunch time of the day of the breach he felt a tremor, but all the workers continued working without worrying. But then by 4:30 pm the the ground shaking felt like an earthquake. * Apparently there were 2 dams that failed, named “Fundão” and “Santarém”. * The breaching of these dams caused the flooding of 1 district of the city of Mariana, in the state of Minas Gerais to be largely destroyed. Doing a google search of the Santarém Dam seems to show that an engineering firm called G-Maia, performed a raising of the dam by a method using an inflatable rubber dam. However the website on the companies page apparently no longer exists, even though the google record shows up. However according to this article it is still not clear which dam breached first, the inflatable rubber top Sanitarium or the Fundão dam. And just to finish this update, thankfully the waste material is mostly silica from iron processing, according to Samarco. Information we received in Brazil is that the waste material is toxic. This article from Viomundo states that the tailings contain mercury, arsenic, and iron. But that is pretty much all it says about the tailings. Technically these articles do not conflict if the majority of the tailings are silica. Neither article gives detailed information on the toxicity of the tailings. Looking at the earlier photo by “Estadao” showing the intact dam on the left and failed section on the right (with overhead pipeline broken), the dam on the west (Fundão) had failed first and its impact caused failure of the downstream dam on the south. From the the available GoogleEarth 2013 image of the site, the failed dam is almost filled with solids and had a diked-in section on its upgradient part possibly used for storage of decant water. Any failure on that embankment may be a cause to trigger the overall failure. The “dryhoff, UK Company”s website mentions installation of a 30m wide, 1m-high rubber dam on the Santerem Dam in 2014 (However, it is not clear if Santerem is the name of the southernmost downgradient pond). It is likely that this rubber dam was built to increase the water retention capacity of one of the failed dams or internal dikes in the north. Any potential failure “related to” this spillway-like short (30m wide) rubber dam (not necessarily its failure; but due to 1-m water level increase in the reservoir) triggered the First Dam (Fundão) Failure. It would be quite informative, if anyone has an aerial photo showing the failed Fundão Dam embankment area. All the photos can be seen at the site above, but like to specific images I think are the best are down below. Thats the best video I have seen so far, however I was watching Journal da TV cultura last night and they showed some good footage too, unfortunately I can’t find a link to their video online. I also noticed a new video on youtube, showing for the first 15 seconds or so, a video recorded of what looks to be large amounts of water flying over a barrier. which talks about the polluting potential of the Germano Dam. In this article it is cited (from the master’s thesis of MATSUMURA, M. S. 1999) that the Chromium content of the Santarém dam was around 8 ng/ml. It seems the geothite mineral may be responsible to reducing the amount of chromium through adsorption. Unfortunately Matsumura’s thesis is nowhere to find online. I however, am not sure how toxic 8 ng/ml of Chromium is. 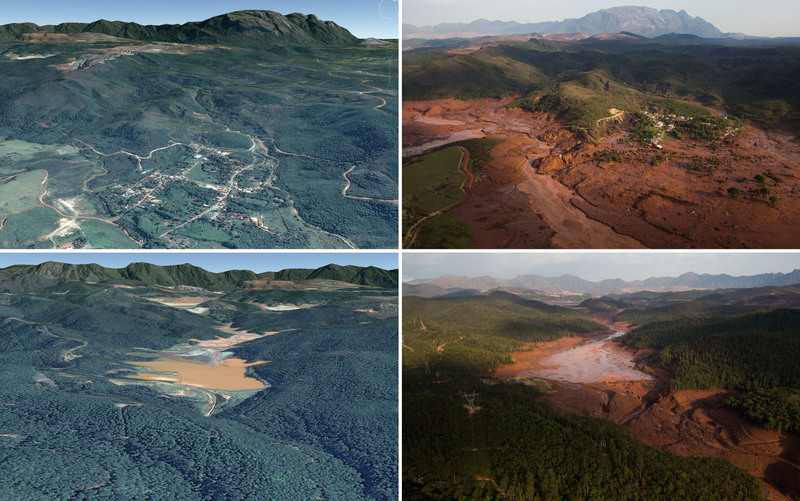 A compilation of the available information (as of 11 Nov, 2015) on the tailings dam failures can be found at https://www.academia.edu/18306417/COMPILED_INFORMATON_ON_Tailings_Dam_Failures_in_Brazil_occured_on_5_November_2015. This information was reviewed for correctness with a Brazilian expert. Thanks for sharing that report Dr. Zanbak. It was helpful in highlighting the dike system of the fundão dam. It seems the key to discovering the origin of this catastrophe is to know which dike failed first. The best footage I found of the fundão dam is from this news report. From the video it is hard to tell, it seems like both dikes failed quite significantly. Thanks for sharing some great satellite imagery, but unfortunately none of the images show the fundão dam. I actually study right next to the Seismology Center at USP, I will ask around to see if they can pinpoint the exact location of these events, that would be very interesting. Its remarkable how far to the south the flood extended into adjacent valleys. I’ll bet that water gap in the ridge to the ESE was the bottleneck. Huge surge followed by gradual drawdown. I wonder at the sheer volume of material required to do that. Some very nice images as well, but unfortunately it doesn’t have the scale to see the fundão dam in detail. Thanks for sharing! Here is a good resolution post failure satellite image. Looks like, the Fundao was raised for another 20 meters since 2013. Based on the video images and the sequence of inner dike constructions, my preliminary opinion is that the “dike A” (north of the island) built on the tailings material has failed first, triggering the sequence of failure events. It may be wishful thinking, but I see a N-S oriented topo lineament at what would be the eastern or left abutment of the dam north of the conveyor belt/pipeline. Possible fault or other shear zone? I’m thinking of the St. Francis Dam failure of the 20’s north of Los Angeles. Yes I see that line as well, if I find any good info on the geology/faults of the region I will be sure to post it. The report claims that the causes of the initial failure is still unknown, but that right now the focus is on preventing any more disasters. There is some speculation that the Santarém Dam is still holding back some more tailings, and could possible fail. Currently the cress of the santarém dam is lower than the spillway, which is visible in the video (at time 0:50). Also after the the failure of the fundão dam, a rupture has appeared on the embankment the Germano dam right next to it, which is being monitored daily with lidar (I believe). 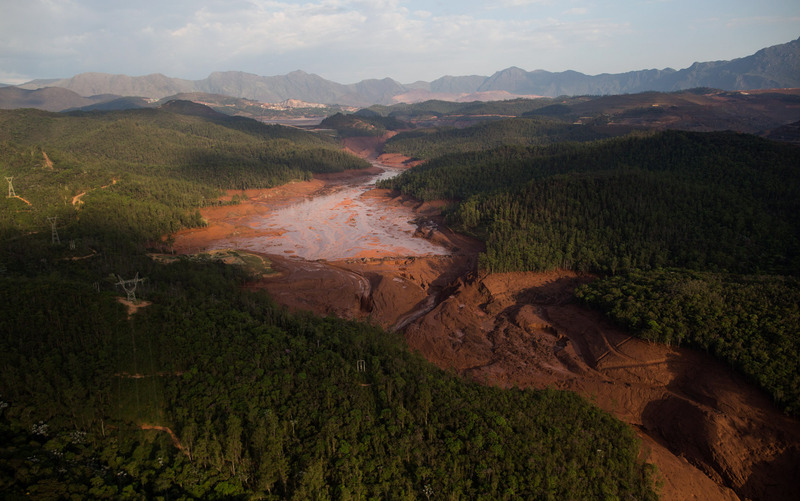 In a news presented on Jornal Hoje, Samarco mining company representatives admitted that there is a risk of disruption in the dams of Santarem and Germano. On Tuesday (17), the director of operations and infrastructure Samarco, Kleber Terra, told a news conference that the safety factor in the Santarem dam is 1.37 on a scale of 0-2, which would mean stability 37%. In Germano, the director said that the dike Selinha – which is one of the structures – has index of 1.22, the lowest in the entire complex. Samarco had informed that the factor of 1.00 means that the structure is in its equilibrium limit. Also according to Terra, emergency works are being done in the two dams. The director explains that rock blocks are being placed from top to bottom, to strengthen the structure. This process should last about 45 days at the Germano dam. In Santarem, the works have a period of 90 days. shows a cartoon at 1:30 as to how the dam may have been heightened vertically: they added fill in the upstream direction atop tailings. A doubt. I have no knowledge in this area, but in such cases there should be a daily technical bulletin on the condition of dams and what work is being done, right? I searched the website of the Companies involved but found nothing. Above is the link to a report by the Center of Seismology at the University of São Paulo (USP) (in Portuguese) at the Institute of Geophysics, Astronomy, and Atmospherical Sciences (IAG). Basically 6 small earthquakes (or seismic events) where registered on the 5th of November from roughly 1 pm to 4 pm (local time). And although the locations of the events are defined by latitude and longitude (and also shown on google earth maps) in the report there is a huge uncertainty in the exact location of the events (up to 20 km), due to the large distances between the seismogram stations. The report also talks about the fact that earthquakes of these small magnitude are not uncommon in the region, and a seismicity map is provided (fig 6). However, there are only very rare cases when a small magnitude event is so shallow that such a small earthquake is known is known to cause damage to structures. The conclusion of the report essentially lists the a series of possible causes of the seismicity, and the fact that more investigation needs to be done. A revised version (with inclusion of the post-failure Airbus Industries and NASA satellite images) of my earlier information compilation on this event is available at https://www.academia.edu/s/845e30b171?source=link (currently open for discussion). Based on the June 14, 2015 satellite image, Fundao crest was raised and the reservoir was filled above the inner levees’ crests. It is more likely that, the failure initiated at the raised levee (immediately west of the Fundao’s Crest) and discharging sludge dragged down all the other inner levees. At this time, there is no available info on the dimensions of the raised levee and the geotech data on the foundation materials; therefore, no comment can be made on the stability (including potential impact of the minor earthquakes mentioned). Remedial (emergency) works were reported on the Germano’s side dike on the west adjacent to the Fundao Reservoir and the partly damaged (overtopped) downgradient Santerem dam. At this time, it is my opinion that Instituto Prístino Report dated 21 October 2013, which points out concerns on the stability of the waste rock pile located North of the “once water reservoir area” due to tailings dam raising above EL920m, does not have direct relationship with the cause of this failure event. Fundao Post-failure image is now available on Google Earth….. The article claims that the dam that failed (I assume they are referring to the fundão dam), was raised through the upstream method (which is the lowest cost and most popular, see http://www.tailings.info/disposal/conventional.htm for descriptions of these methods in English). This method of tailings dam raising appears to be the most common to have significant failures causing environmental damage according to (ICOLD and UNEP 2001), from http://www.tailings.info/disposal/conventional.htm. It will be interesting to see if liquefaction induced flow is a culprit for this failure. Thank you for the newspaper article. As expected, the newspapers are after accusative points to make. Yes, the tailings dam raising method used is “upgradient”; however, this does not deserve labeling as “a inappropriate method”. In reviewing several chronological aerial images available, it is my opinion that the dam raising sequences look proper (they have been raising the dam in a way to keep the toe of the waste rock pile on the north dry, likely in order to address the 2013 report by “Instito Pristino”). However, the leves of tailings behind the inner levees were quite high; meaning they were raising Fundao quite fast and loading the inner reservoirs to their capacities (likely, under ore production increase pressures). The slopes of the Fundao raises seems to follow the original design, 1V:~5H). And they were using in the Fundao Dam construction areas with heavy truck, on quite dry material. However, the inner levees on the west were quite full with tailings&water. It is likely that the failure occured on the inner levees on the west potentially due to uncontrolled excess sludgy tailings overtopping the levee and scouring it and triggering a flood towards the Fundao main dam under construction. In summary, it is my opinion that the dam design method was OK; however, tailings disposal program was “too fast”, not in sync with the Fundao Raising Program. Of course, it will take at least a year (or more)to get any investigation results on the actual cause of the failure; the my comments above are only for discussion purposes. It shows this in cartoon form. I wonder if the retained material had mechanical characteristics similar to “quick clay”, and was subject to shear-induced liquefaction. As such, a relatively small initiation site could “unzip” the entire mass. Successive levels of dam construction would be founded on something resembling flan custard. So sad so many people were hurt and such an environmental disaster resulted because this was the cheap and easy way.